In this type of work environment, the key to time management is setting 'SMART' goals and using effective techniques for overcoming the procrastination that can so often impede the achievement of these goals. Specific: Goals need to be about achieving something very specific. For instance, do you want to increase your leads from referrals? Or do you want to build your social media followers? The more specific your goals, the clearer your action plans can be. Measurable: Goals need to be measurable. For example, if you want to increase your leads from referrals, is your goal to increase them by 2%, or is it 20%? There's an expression in business that "What gets measured, gets managed." It's difficult to manage goals that are not measurable. Achievable: Goals need to be reasonable and achievable. Don't set yourself up for failure by setting goals that are out of your reach. Relevant: Goals need to be relevant and rewarding to you. It's easier to do tasks when you have a clear idea of what are your benefits. Time-Framed: Goals need to have a clear time horizon. Having a specific time horizon gives you the impetus to get started. It also helps you monitor your progress. Even with very SMART goals, one of the biggest obstacles to achieving these goals is overcoming procrastination. 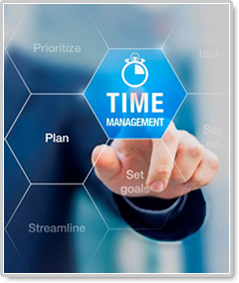 Time management guru Alan Lakein teaches that the key to overcoming procrastination is identifying "instant tasks" for your highest priority goals. "Instant tasks" are activities that can each be done in about 5 minutes that help you move forward with your most important goals. For example, if one of your goals is to increase leads from referrals, an "instant task" could be to could be purchasing gift cards when you are at the grocery store, so that you have them ready to send as "thank you's" for referrals. Or another "instant task" could be putting together a target list of the top people who have referred clients to you in the past. Then when you find that have a spare 5 minutes, you can easily pick off one of these quick and easy-to-do "instant tasks." And before you know it, you will be well on your way to accomplishing one of your highest priority goals, and very proud of yourself for overcoming your procrastination!